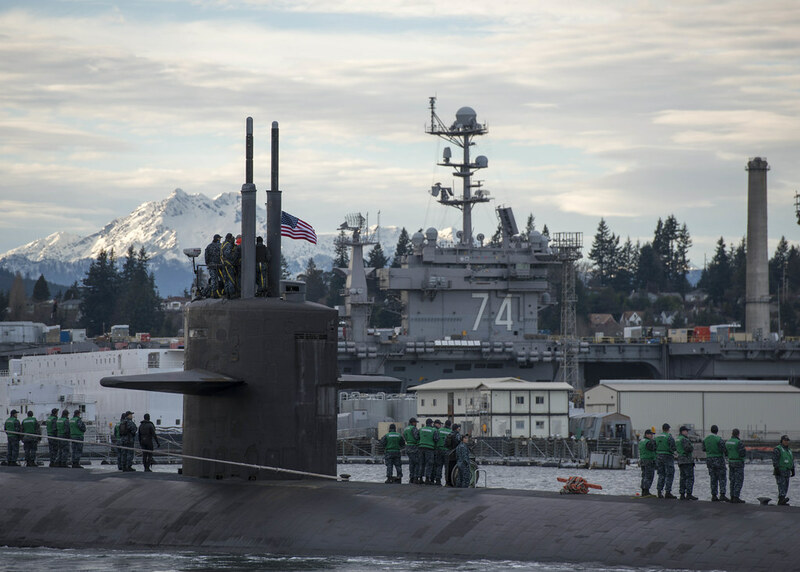 BREMERTON, Wash. -The crew of the Los Angeles-class fast-attack submarine USS Olympia (SSN 717) concluded a visit to the Pacific Northwest, Jan. 30, following a series of engagements with key civic and community leaders as well as engaging with locally-based organizations. The namesake visit provided an opportunity for the crew of Olympia to demonstrate the quality of naval personnel to the citizens of the Pacific Northwest, particularly the city of Olympia and surrounding areas. Olympia arrived at Naval Base Kitsap-Bremerton Jan. 27, and was greeted on the pier by community leaders and supporters, including former Secretary of State Ralph Munro. Tours of the submarine were given to various groups to include the Sea Cadets, the Navy League, the Submarine League and government officials. Over 60 crew members boarded buses in Bremerton and traveled to the city of Olympia, Jan. 28. During their visit, they performed community relations projects, toured the capital and surrounding attractions, and met with community members. A lunch was also held for the crew by the Olympia Yacht Club and the boat performed an awards ceremony in front of the large audience. Four Sailors were pinned with their submarine enlisted warfare “dolphins”, four Sailors were presented with the Navy and Marine Corps Achievement Medals, and the Sailor of the Quarter and Blue Jacket of the Quarter Sailors were announced. Sailors helped the community by painting and organizing the Salvation Army transitional housing center, stuffing backpacks with the Gateway Rotary Club for the Homeless Backpacks non-profit organization, and making and handing out sandwiches at the Interfaith Works Winter Warming Center. 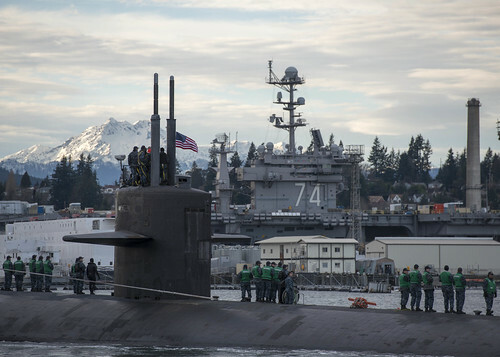 The final day of their visit, the crew enjoyed liberty in Bremerton. The Navy League and Submarine League hosted a dinner for the crew at a local restaurant called the Horse and Cow. USS Olympia is the second ship of the United States Navy to be named after Olympia, Washington. Commissioned on Nov. 17, 1984, Olympia is the 29th ship of the Los Angeles-class nuclear powered fast-attack submarines. The submarine is 362-feet long, displaces 6,900 tons and can be armed with sophisticated Mark-48 torpedoes and Tomahawk cruise missiles.